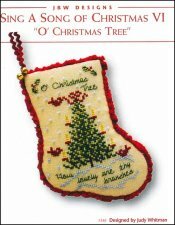 Sing A Song Of Christmas 6: O' Christmas Tree [H1708] - $7.00 : Yarn Tree, Your wholesale source for cross stitch supplies. Cross stitch pattern by JBW Designs. The verse "O Christmas tree, how lovely are thy branches" is accented by a Christmas tree, bows, birds. and other seasonal motifs. Stitch count 48 W x 66 H. Stitched on #7539 Belfast Linen latte.